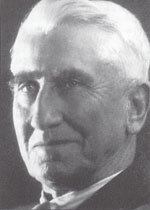 As the driving force behind the creation of the Ko-operatieve Wijn-bouwers Vereniging van Zuid-Afrika, Beperkt (The Co-operative Wine Growers' Association of SA, or KWV) in 1918, Charles W H Kohler can be regarded as the most important figure in the Cape wine industry in the twentieth century. Under Kohler's leadership this organisation saved the wine industry from certain ruin. It was he who guided the KWV through good times and bad as chairman of the board for more than three decades until his death in 1952. In so doing, he achieved his initial goal, which was to stabilise the wine industry. Kohler's contribution to the industry was important to the Western Cape in a wider sense, because tens of thousands of people, including wine farmers and their workers, depended directly or indirectly on this most important industry of the region. For this reason alone Kohler fully deserved the epithet "Father of the KWV" bestowed on him by his contemporaries. The creation of the KWV arose from the depressed state of the wine industry at the start of the twentieth century. Wine depressions, where production grew sharply and no proper markets could be found for these surpluses, had occurred periodically since the early eighteenth century. The inevitable result of these conditions was a drastic drop in wine and brandy prices, threatening the livelihood of wine farmers and their dependants. At the end of the South African War in 1902, the large incidental markets for Cape wines and brandy created by the large British military presence disappeared. At the same time wine production was growing apace after the re-establishment of vineyards that had been decimated during the preceding decade by the Phylloxera blight. In 1907 more than 260 000 hi of wine and 60 000 hi of brandy more than ever before were produced. Huge surpluses resulted and wine prices fell to under -£3 a barrel (about 578 litres), making wine farming unsustainable. There were now few wine merchants and many of these did practically as they pleased with regard to the prices paid to wine farmers ... The price of wine has already dropped to -£2- 15s a leaguer and there was every prospect of it falling still further, for the wine-farmer was completely powerless and while prices were fixed arbitrarily he was forced by bitter circumstances to accept whatever was offered to him. Never before had the wine industry been at so low an ebb as in 1916. Never before were wine farmers in deeper despair. At this point, with the wine industry facing the most serious crisis in its history, Kohler came forward with his life-saving proposal. But who was this man? Charles WH Kohler, the son of a British architect and engineer, was born on 14 October 1862 at Calvinia in the former Cape Province, where his father designed and built government offices. After making his fortune on the Witwatersrand gold-fields, Charles Kohler settled on the farm Riverside, next to the Berg River near Simondium in the Drakenstein area. After 1904 Kohler was involved in several initiatives, of which the most significant was his master plan of 1916 to save the wine industry from its woes. Although the co-operative idea was new and untested in South Africa at that stage, Kohler believed that uniting all wine farmers in one giant co-operation was the only solution to the dilemma in which the industry found itself, and also the quickest way for gaining control and establishing stability. His idea was in essence that such a body should be restricted to bona fide producers for the protection of their interests, inter alia against the arbitrary actions of wine merchants. Minimum prices would be set to establish a basic price for the producer that would guarantee an adequate, consistent yield from his produce. Annual surpluses of distilling wine would be declared, for which the farmer would not be paid directly. This wine would be collected by the co-operative and distilled into spirits that would be exported or otherwise disposed of, on condition that it was never sold on the South African market for less than the set floor price. Kohler was sure that his master plan would convince most farmers to unite in a large co-operative. Towards the end of 1916 he consequently started propagating his plan personally with fanatical zeal to wine farmers in the most important regions. He invited them to a planning meeting at Paarl, at which a draft constitution for the proposed co-operative was to be discussed. On 13 December 1916 the historic meeting of delegates took place in the Paarl Town Hall. Kohler, who was elected chairman, presented his draft plan for the co-operative. The delegates enthusiastically approved the draft, containing the above-mentioned principles and procedures. The co-operative would be known as the Co-operative Viticultural Union of South Africa, which was later changed to the Ko-ope-ratieve Wijnbouwers Vereniging van Zuid-Afrika, Beperkt. Armed with the approved constitution Kohler held numerous meetings in the main wine-growing areas in the course of 1917, encouraging wine farmers to join the proposed wine co-operative by endorsing the constitution. Thanks to his persuasive powers there was immense enthusiasm and by the end of 1917 more than 90 per cent of all farmers had signed. With such support the interim board under Kohler as chairman could proceed with the registration of the co-operative: this was done in December 1917 and formalised on 8 January 1918. This was the official incorporation date of the KWV and the realisation of Kohler's dream. The co-operative was founded as an ordinary limited company in terms of the then Cape Company Act (Act 25 of 1892) with founding capital of £100 000 divided into 200 000 shares of 10s each. The first special KWV shareholders' meeting was held in Paarl on 8 May 1918. On this occasion the first official board of twelve was elected with Kohler as chairman. The creation of the KWV brought immediate success and initial stability to the wine industry. After the establishment of the co-operative the floor price for wine was double that of 1916. In fact, due to a shortage of wine and speculation by wine merchants, the price shot up to an astonishing to £20 a leaguer in 1920, an enormous price for the time. All participants were overjoyed by this positive development and Kohler received widespread recognition for his dynamic role in the creation of the KWV. An objective observer of the KWV in its infancy would already have seen some warning lights flickering: the abnormally high wine price was not the result of sound business practices by the KWV but rather due to an unusual demand for wine and especially the wild speculation of wine dealers. The control that the co-operative could exercise inside the wine industry was also subject to many restrictions. For instance, its first articles did not give it the legal authority to control the dramatic increase in the planting of new vines and the consequent rise in production. There was also no legal obligation on farmers to join the KWV or to remain members. The KWV furthermore initially only exercised a measure of control over distilling wine and that depended on the voluntary co-operation of producers. When the wine surpluses started increasing sharply after the end of 1920, all the above shortcomings started emerging, to such an extent that the survival of the KWV was put in jeopardy. The KWV was simply not able to dispose of its total surpluses efficiently and was obliged to destroy a large percentage of the surplus built up between 1921 and 1923. This, as well as the sharp drop in wine prices compared to those during its boom, led to an exodus of members, while others conspired with wine merchants by selling their distilling wine at less than the floor price. Most of the merchants also refused to buy from the KWV. The body's continued existence was balanced on a knife edge in 1923, and the only solution was to ask the government to give the KWV sufficient powers through legislation to control the industry effectively. The breakthrough came in 1924 after Kohler and other prominent members had made serious representations to government. The act controlling wine and spirits was introduced through the personal intercession of Prime Minister Jan Smuts that same year. The KWV was given legal control over distilling wine, brandy and wine spirits, but quality wine was excluded from the act. In practice the organisation now had the authority to set minimum prices for the products over which it had been given control. To accommodate the merchants, the KWV and its members were prohibited from selling any form of wine spirits in Africa south of the equator at less than the floor price. Kohler headed the KWV with distinction from 1924 until his death, turning it into the most successful agricultural co-operative in South Africa. During this period the organisation not only stabilised the wine industry, but also undertook initiatives for the benefit of the wine industry and the South African economy in general. The KWV's control over wine surpluses eliminated unexpected crises, and this in turn guaranteed a secure living for its members, even during the Depression of 1929-1933, when the wine industry would have foundered without the KWV In 1940 the KWV also gained legal control over quality wine and the right to impose import quotas when circumstances demanded a limit to domestic wine production. These new legal control measures were in fact a vote of confidence in the KWV, Kohler and his board. As a business the KWV went from strength to strength under Kohler's firm leadership. Its strong financial position was reflected in the fact that its assets amounted to £718 205 in its tenth year, while liabilities amounted to a mere £64 518. It had more than £200 000 invested in government bonds and it had reserves of tens of thousands of pounds to provide against wine surpluses and the costs involved in maturing export wine and brandy. By the end of 1939 it already possessed the largest, most modern above-ground wine cellars in the world and a large, well-equipped head-office building in Corporation Street (the present Kohler Street), Paarl. Apart from its cardinal role in the stabilisation of the wine industry, the KWV was also instrumental in the establishment of South Africa's wine export trade in the twentieth century. From the 1920s surplus supplies were turned into products such as perfume, liqueurs, sherry, dessert wine, port and brandy, and from the 1940s also into world-renowned red wines. The KWV spent millions on developing export markets for its wines and spirits. Although the results were often varied, the value of wine and brandy exports had reached almost £600 000 by 1945.Kohler took a great personal interest in promoting exports and made numerous visits to Europe and the US his last at the age of 86! The successes of the KWV were in large measure attributed to Kohler; as early as 1939 some KWV members wanted to honour him for his contribution to their welfare by awarding him the tide "Life Governor and Chairman of the KWV". He declined, regarding it as a sufficient honour to be known among the members as "our chairman". In 1947 Stellenbosch University bestowed an honorary doctorate in commerce on him. After 33 years without a break as chairman of the KWV he acted in this capacity for the last time at the 33rd annual meeting on 15 June 1951 at the age of 88. He died at his retirement home in Fish Hoek on 6 February 1952. His coffin was transported to Paarl where it lay in state in the KWV's Cathedral Wine Cellar before the service. Here many people paid their last respects to Kohler before his body was taken to Cape Town to be cremated. With this, Charles Kohler disappeared from the annals of the South African wine industry. His legacy and brainchild, the KWV, played a crucial role in the establishment of a vibrant wine industry that became an important source of revenue and earner of foreign currency, in the process creating an industry that provided a livelihood for tens of thousands of people. • Please note: This biography is a modified extract from the following source: Van Zyl, D. (1999) “Charles W H Kohler” from They Shaped our Century: The Most Influential South Africans of the Twentieth Century. Published by Human and Rousseau. p. 399- 403. If you would like to contribute to this biography please click on the contribute tab.